I thought this would be my last medieval feast post, but there are still a few more. Yes, more. That was a lot of food! This was a neat pie. I’ll probably make it another time, minus the chopped dates. 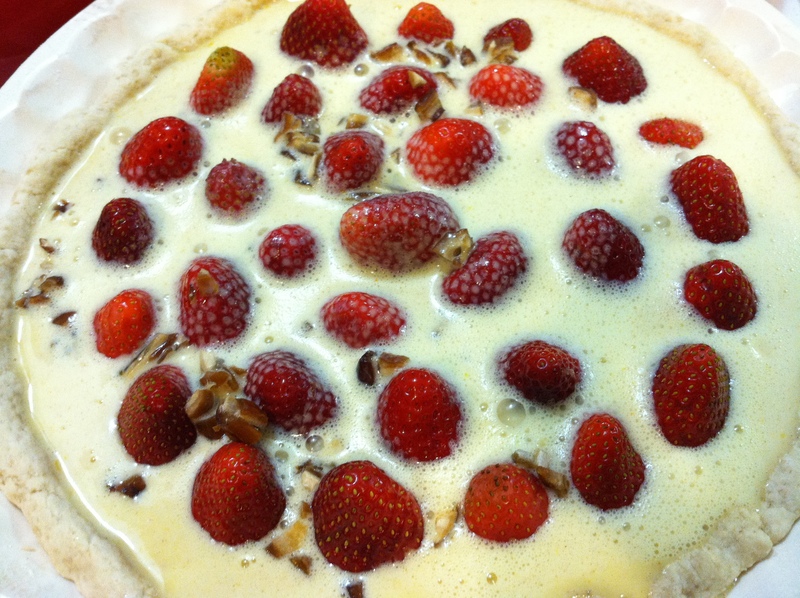 Without them it would have been a creamy, custard pie with strawberries. The recipe came from godecookery.com and called for the strawberries to be sliced. I thought it would be more fun to stand them on their heads, whole, and pour the custard mixture over. The tips just poked through the baked custard. I have been loving Florida strawberry season. It’s like summer around here lately with all of these strawberries available and I don’t remember there being so many other years. My grandparents loved the Florida Strawberry Festival when I was a kid. They would load up on the fresh, ripe berries and Grandma would freeze them in lots of sugar. I ate them right from the freezer bag when she would give us a batch. Our strawberries ripen in the summer here in the mountains. Until this past summer I had only picked my own from the potted strawberry plants I have grown over the years and wild from a sunny hillside patch my brother showed me when I came to the mountains from Hawaii to visit my family when my husband was deployed. Those tiny wild strawberries were the best I have ever eaten, but as they were the size of the end of my little finger, it would have taken a lot of them to make anything with or to preserve. I think Mother Nature just sprinkled them around for nibbling. But in the warm season, my family and I visited a strawberry farm and picked our own berries. It is important, I believe, to teach our children where food really comes from, but honestly, my family and I visit U-Pick farms just for the fun of it. It was a great day out in the heat with pickers playing under big spreading oak trees and farmers plowing in the field behind their horses, stirring up dust as they went along. I can hardly wait until next summer when we can do it again, though I have to say, being a Florida girl and all, as delicious as those strawberries were warm from the field they can’t compete with the Florida grown pints I have been buying lately. I’m all out. Is it grocery shopping day yet? One baked pie shell. I made a full batch of the recipe that was given for the Cherry Tort at godecookery.com and baked one to use for the Daryoles. 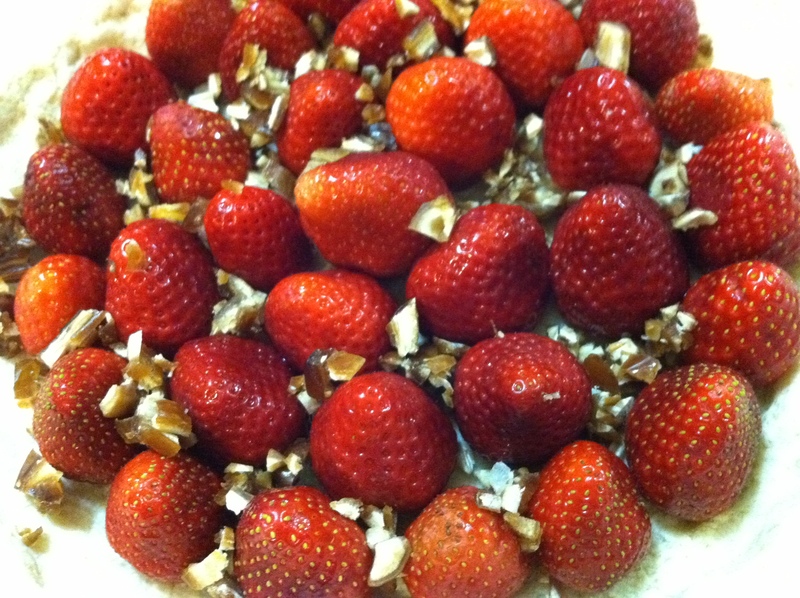 Place strawberries in the bottom of the baked pie crust. Sprinkle the dates over them. Mix together the remaining ingredients. 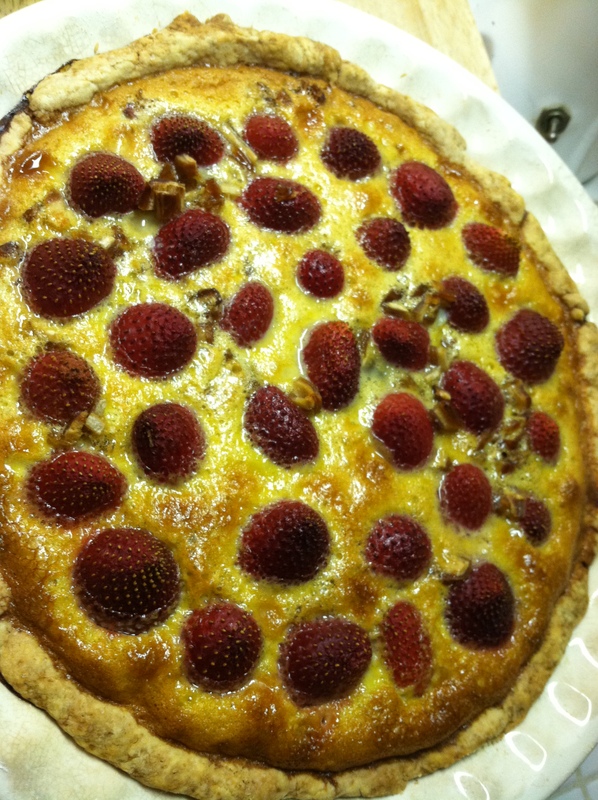 Pour the custard over the strawberries and dates in the shell. Bake for 45 minutes to 1 hr. until set in the center. I chilled it before serving, thinking it would be better cold.